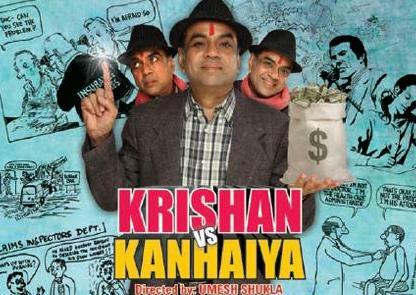 Krishan VS Kanhaiya: Classic Paresh Rawal! I am blogging after a long time. Although, there are a couple of important things to write about – A new book on marketing that I’ve read (I will blog about it later) and switching from Symbian to Andriod (late mover, I know! ), right now I am going to blog about a play I saw at the Tata Theatre, NCPA. The legendary theatre at Nariman point offered the stage to Paresh Rawal and his team who performed the play, Krishan Vs. Kanhaiya. The play is produced by Swaroop Sampat (Paresh Rawal’s wife and herself an actress and model – she won Miss Universe in 1979). I haven’t seen too many theatres but in the few that I have, the obvious realization is that the mastery over the performer’s art has to be a lot more detailed and deep in case of theatre. In theatre, as in life, there are no re-takes. And to me, Paresh Rawal characterises that perfection. No wonder his comic timing is often as accurate a sharp shooter. This particular play shows Paresh Rawal playing a small-time businessman who runs an antique shop and his brush with God, religion, beliefs and virtues. Although it is a comedy, it opens some very hard truths about society, culture, religion and idol worship. In the form of dialogues in scenes that range from household issues between a couple to the corny, but still favourite ‘court scene’, the intent of the author comes out strongly in the script. The play itself flows in the form of intense debates and discussions focussed on the specific issues that it wants to address The dash of comedy intertwined at every juncture is actually funny, and far from slapstick. Although it encourages the audience to challenge the status quo and ‘know’ why rituals and rites are performed, it ends on a neutral note. The script (which is genuinely a piece of art!) leaves the intelligent audience to conform to his or her own beliefs without forcing him or her to take a stand. To that extent, it is open-ended in its message. But it is not open-ended in the communication. The communication is clear – ‘know thyself’ – and know what you are doing, and why. If not for the laughs that it is guaranteed to give you for the time that you are inside the theatre, watch it for the fact that it might make you challenge some of the things you say or do every morning. This play “Kishan Vs Kaniyya” by Paresh Rawal,Swaroop Sampat (writer) & team is really too good & inspiring, The only thing it silents about not mentioning OSHO name while the whole concept & theme is 100% influnced by him. Please mention Osho name after the play.. But how bout you watch this Film and tell me if its all the same ? Next Next post: Kahaani: Pre-release opinion – Oh Calcutta!